Braun Silk-expert IPL BD 5009 hair removal is a new IPL system which results in permanently visible hair removal in four to five treatments. Braun Silk-expert works beneath the skin’s surface by targeting the melanin in the hair follicle, which helps to break the cycle of hair regrowth. Braun Silk-expert helps prevent unwanted hair from reaching the skin surface with continued, regular use. Actually, when you use an IPL device Skin tone varies across different parts of the body. So each skin tone requiring a particular energy level to target the melanin. Braun Silk-expert has the novel SensoAdapt skin tone sensor which continuously reads your skin tone with the speed of 80x per second and Braun Silk-expert SensoAdapt Sensor will automatically adapt the IPL light intensity for best results with safety. SensoAdapt skin tone sensor removes the guesswork of having to match your skin tone against the complicated color matching charts other IPL devices require. Braun Silk-expert provides full body treatments for up to 15 years, or up to 35 years in smaller treatment areas like lower legs, underarms, and upper lip. Braun Silk-expert is the fastest IPL technology home hair removal machine on the market. 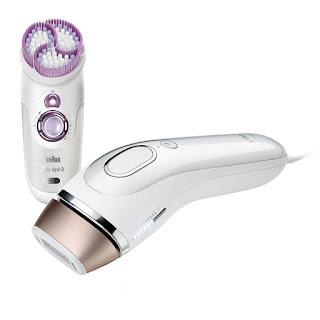 Philips Lumea vs Braun Silk IPL BD 5009:- Both machines the Philips Lumea and the Braun Silk-Expert IPL BD 5009 use IPL (Intense Pulse Light) technology. IPL hair removal is a light-based treatment which targets the melanin (pigment) in the hair follicle to disrupt the cycle of hair growth. With regular use, of this treatment over the time hair growth is significantly reduced.